Animator. Nationality: American. Born: Spokane, Washington, 21 September 1912. Education: Attended Chouinard Art Institute, Los Angeles. Family: Married Dorothy Webster (deceased). Career: Early 1930s—worked at various animation studios in variety of capacities, including for Charles Mintz at Screen Gems, Ub Iwerks at Flip the Frog Productions, and for Walter Lantz; about 1935—joined Warner Bros. as animator; worked under Ub Iwerks, Robert Clampett, and Tex Avery; 1938–62—cartoon director for Warners; 1955—four months at Disney Studios, then returned to Warners; 1963–67—directed for MGM; 1970-on—directed and produced television specials. Awards: Academy Award, for For Scent-imental Reasons , 1949; So Much for So Little , 1949; The Dot and the Line , 1965; Peabody Award, for Horton Hears a Who , 1971; L.A. Critics' Award, for life achievement, 1990; Academy Award, for life achievement, 1995. Another Froggy Evening (+ pr); That's Warner Bros! Chuck Amuck , New York, 1989. Chuck Jones' Peter & the Wolf , New York, 1994. "The Road Runner and Other Characters," interview with R. Benayoun, in Cinema Journal (Evanston, Illinois), Spring 1969. Interview with M. Barrier, in Funnyworld (New York), Spring 1971. Interview with J. Colombat, in Image et Son (Paris), January 1972. "The Hollywood Cartoon," interview with J. Canemaker, in Filmmakers Newsletter (Ward Hill, Massachusetts), April 1974. "Animation Is a Gift Word," in AFI Report (Washington, D.C.), Summer 1974. Interview with G. Ford and R. Thompson, in Film Comment (New York), January/February 1975. "L'Animation, un art nu," in Positif (Paris), February 1975. "Cel Washer: 'Kid-vid' Is a Dirty Word," in Take One (Montreal), no. 4, 1976. Interview with J. Rubin, in Classic Film Collector (Muscatine, Iowa), Summer 1976. "Friz Freleng and How I Grew," in Millimeter (New York), November 1976. "Chuck Jones Interviewed," with Joe Adamson, in The American Animated Cartoon , edited by Gerald and Danny Peary, New York, 1980. Revue du Cinéma (Paris), no. 465, November 1990. "A Master of Animated Art: Chuck Jones," an interview with Gregory J. M. Catsos, in Filmfax (Evanston), August-September 1992. "The Return of Duck Dodgers. Sequel to the Cartoon Classic," in Outré (Evanston), no. 7, 1997. Kenner, Hugh, Chuck Jones: A Flurry of Drawings , Berkeley, California, 1994. Thompson, R., " Duck Amuck ," in Film Comment (New York), January/February 1975. Cohen, M. S., "Looney Tunes and Merrie Melodies," in Velvet Light Trap (Madison, Wisconsin), Autumn 1975. Ward, A., "Master Animator Chuck Jones: The Movement's the Thing," in New York Times , 7 October 1979. Thompson, Richard, "Meep Meep!," and "Pronoun Trouble," in The American Animated Cartoon , edited by Gerald and Danny Peary, New York, 1980. Cahiers du Cinéma (Paris), December 1982. Plateau , vol. 7, no. 4, 1986. Cahiers du Cinéma (Paris), September 1990. O'Brien, Ken, "Chuck Jones and MGM: Reevaluating Tom and Jerry," in Animation Journal (Irvine), vol. 1, Fall 1996. Williams, David R., "The Mouse that Chuck Built," in Animation Journal (Irvine), vol. 2, Spring 1997. 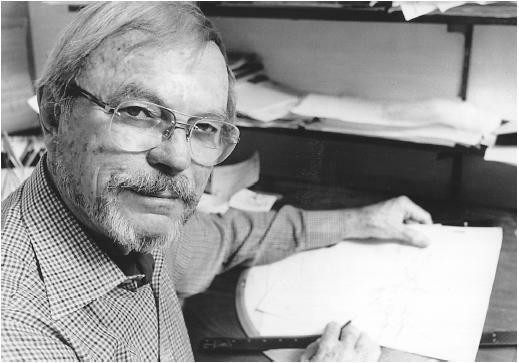 During a career of nearly 60 years (and still going strong) in cartoon animation, Chuck Jones has created more than 240 animated films. His most famous work was done at Warner Brothers where from 1938 to 1962 he directed such "stars" as Bugs Bunny, Daffy Duck, and Porky Pig. Although many different animators worked with these characters, Jones developed his own particular style of animation that set his cartoons apart from the others. Part of that style has to do with the development of his characters, who have very strong personalities. For example, Pepe LePew is an ever-confident Casanova. No matter how many times he is pushed off the road to romance, he remains undaunted in his attempts to pursue his heart's "true love." Daffy Duck, on the other hand, is a self-centered egotist. He is always looking out for "number one", and he must, above all, maintain his dignity. By using such strong characters in his films, Jones creates humor not out of what is happening to the character, but from how the character reacts to what is happening. For example, the Roadrunner series (one of Jones's own creations) relies on character reaction throughout the story. Whenever Wile E. Coyote finds that he is about to go over the edge of a cliff, he remains in midair, looks down, realizes his predicament, gulps, looks to the audience for sympathy, and then falls. The humor is not in his falling, but in the way Wile E. Coyote reacts to his situation. Another characteristic found in many of Jones's cartoons is his distinctive use of the medium. It is not uncommon to find references to the techniques of animation in his films. The most obvious example of Jones's self-reflexivity in a cartoon is Duck Amuck . In this film Daffy Duck is plagued by the animator who, in a series of gags, erases Daffy, gives him the wrong voice, rolls the picture, collapses the frame line, and finally blows up Daffy by drawing in a bomb. Another of Jones's cartoons that is filled with in-jokes is the Oscar-winning What's Opera, Doc? In this cartoon (which can be viewed as a parody of Disney's Fantasia ), Bugs Bunny and Elmer Fudd continue to play their roles of the hunter and hunted, but as "actors" within the very formal structure of a Wagnerian opera. It is the only cartoon in which Bugs "dies," but, as he says while the camera irises out, "What did you expect in an opera, a happy ending?" One Froggy Evening , a comic parable on the lure of fame and riches in which a man finds a singing frog and sees dollar signs but loses everything because the frog will perform only for him, is one of Jones's most memorable creations. Another distinctive trait that can be found in Jones's cartoons is his sense of comic timing. Whereas some cartoon directors pile gag upon gag at a frantic pace, Jones often uses pauses within his gags. For example, when Wile E. Coyote fell from a cliff, the overhead point of view would show him getting smaller and smaller until he was invisible, and a few frames later a puff of smoke could be seen where he crashed. Jones knew exactly how many frames it would take to create the right amount of tension before Wile E. Coyote actually hit the ground. It was a piece of timing he had to teach all of his animators on the Roadrunner series. With the closing of the studio cartoon departments, Jones moved his animation talents into television and feature-length production. His more recent work has proven to be very popular with audiences. Now viewed as the craft's elder statesman, he has been paid homage to by a generation of admirers, including such as directors Steven Spielberg and Joe Dante, who not only acknowledge Jones's influence on the slam-bang style of their own work, but frequently give him cameos in their films. He continues as well to lend his innovative hand to advances in the art of animation such as the groundbreaking Who Killed Roger Rabbit? , which seamlessly mixed live action with cartoon images. The Academy of Motion Picture Arts and Sciences honored Jones with a special life achievement award in 1995 for the enduring appeal of his work, which shows no signs of age.